Italians have always been passionate about gardens. 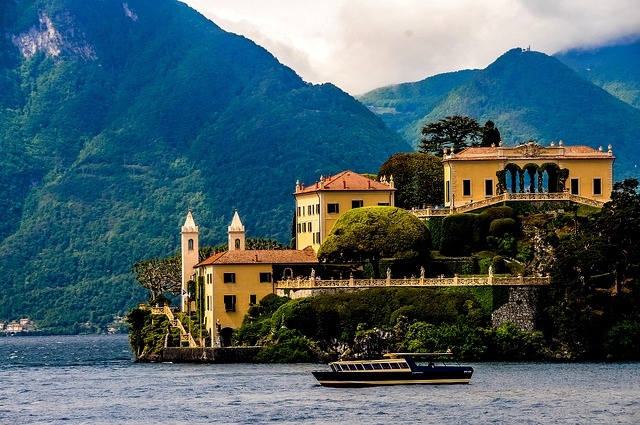 Whether their hands work the soil for their kitchen or if the ground is meant to produce places of retreat and beauty, the Lake Region offers within a relatively small geographic area more gorgeous gardens than any other comparable region in bella Italia. Many years ago, I was privileged to make the acquaintance of Alessandro Tombelli who is both a garden historian and a landscape designer. From the city of his birth, Florence, he has traveled the world to work in gardens as far flung as Chicago and Sicily. His passion for the lush verdant land is unquenchable. In the years we have worked together, he has proudly shared his incredible knowledge of gardens, particularly those in the lake region. His 2008 book, The Garden Connection, tells the story of his life, lived amongst the beauty of Italian gardens. Over many seasons, I have had the opportunity to return to many of the gardens Alessandro first shared with me. While what follows is hardly a complete list of the gardens in the lake region, these are the ones I know and love the best. 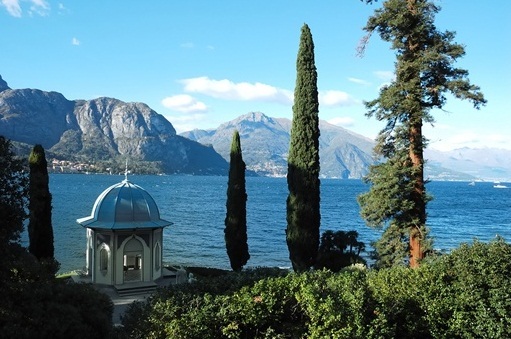 As visitors take in the ravishing beauty of the coast road north of Como toward Tremezzo, they can hardly believe the stunning beauty of the Villa d’Este. To use the words ‘awe inspiring’ seem futile. Originally named the Villa Garrovo, its name was changed by the wife of George IV’s wife. This now famous five-star luxury hotel maintains a gorgeous garden. You can visit the gardens by parking at the hotel and asking at the desk. Inquiries are always welcomed. In the event you are intimidated by the luxurious surroundings of the lobby, keep a mind this story a friend once told me. In the early 1950’s a young newlywed couple from England were making their way, late at night, in a small sports car along the lake. As they left Como, they decided to stop at the first hotel they saw. They approached the front desk at Villa de’Este and, with few coins in hand, explained to the manager that they were just married and hoped to pay for a room at the hotel. The manager took a long look at them, called the porter to the front and the couple was courteously escorted to the Bridal Suite of the hotel. The couple returned every year that health allowed, and were always treated with the utmost courtesy. Such service remains a hallmark of a hotel known for an incredible garden. 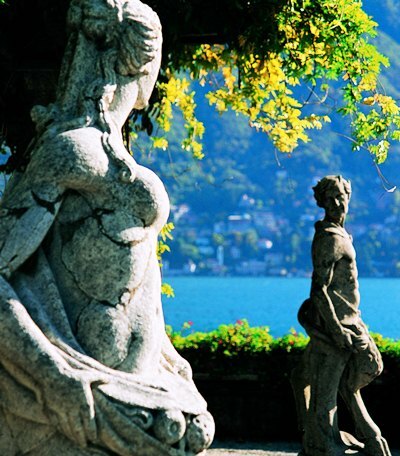 Further north along the western shore of Lago Como, near Tremezzo, is the Villa Carlotta. This stunning villa ascends the steep flanks of alpine foothills from lake to garden. Constructed between 1690 and 1745. Owned by one Marquis Clerici, the gardens have become a well visited botanical garden. There are, during high season, hoards of tourists, yet this is a space of green and flowers well worth the visit. Ah, Bellagio. The approach by ferry from the docks at Cadenabbia is breathtaking. Deep glacial depths of the lake, the reflection of a rainbow of colored stucco palazzi on the surface of the water, the haze shrouded alps in the distance all conspire to move visitors into a dream. 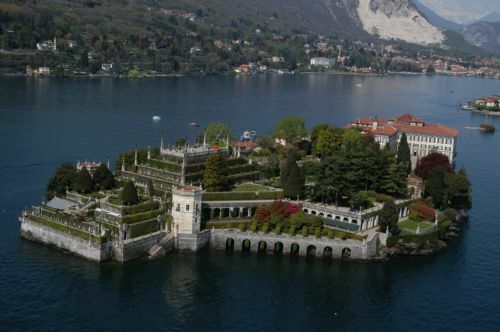 As you disembark at the ferry dock, and walk to the right, you are quickly guided to the entrance of the gardens at Villa Melzi, yet another treasure of a garden, this time on the eastern shore of Lago Como. (The photo at the beginning of this post is a view of Balbianello ). I have saved the most beautiful villa and gardens for last. 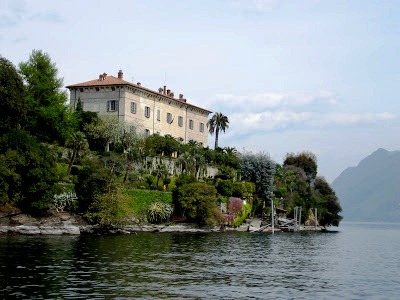 Villa Balbianello was built in the lake side village of Lenno. Located not far from Tremezzo, the villa occupies a promontory that thrusts itself out into the cerulean waters of the lake, the golden stucco towers and emerald green Italian cypress sentinels along the shore. This villa was built in 1787 on the grounds of a Franciscan Monastery. The church towers of that monastery still stand. It was after decades of neglect that an American Army office by the name of Butler Ames purchased and restored the property. The first man to lead an Italian team to the summit of Mount Everest, Guido Monzino, purchased the property in 1974 and lived there until his will donated the property, in perpetuity, to the National Trust of Italy. 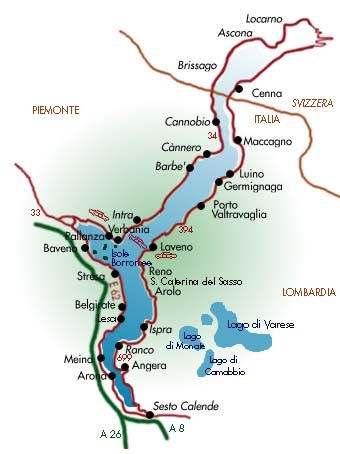 I now head west to the shores and islands of Lago Maggiore. It was in 1632 that Carlos III of the House of Borromeo began to build a villa dedicated to his wife, Isabella D’Adda. The island, originally named l’isola inferiore or isola di sotto, is named in Isabella’s honor. The completion of the villa and gardens was delayed by epidemics of Plague and political power plays.It was not until the latter part of the 18th Century, under Gilberto V Borromeo, that the villa and its gorgeous gardens were finally completed. 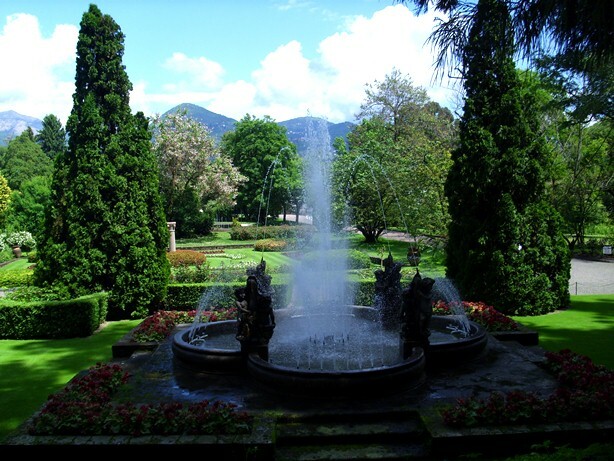 The gardens and villa were designed by the Milanese architect Angelo Crivelli. In 2008 the gardens reopened after detailed three year restoration and the results show. From the upper level garden terrace with its multilevel grotto to the views of the lake and villages along the lower steps of the south garden, this is one of the finest and most beautiful gardens in Italy. Please see, also, the July 2012 blog post Borromeo Islands-Isola Bella. As visitors continue east from Isola Bella across Lago Maggiore, they will have the opportunity to disembark at Villa Taranto. From the dock, little can be seen of the spectacular gardens above. It was in 1931 that a Scottish Captain, Neil McEacharn, came across the property and decided, within hours, to purchase it. The previous owner, the Marquise of Sant’Elia, was thrilled to be rid of something he considered a monumental responsibility. McEacharn went to work, first naming the villa after a distant relative who was awarded the Dukedom of Taranto by Napoleon.The results of the Scottish Captain’s, and of the estate’s administrator Antonio Cappelletto’s, efforts show an extraordinary level of dedication. The gardens now contain one of the finest botanical collections found anywhere. The entrance gate to the estate is easily reached from the ferry landing in about three minutes. Tiny Lake Orta lies west of Lago Maggiore, an easy forty minute drive from the lakeside village of Stresa on the western shore of Maggiore. Not known for a large number of gardens, many consider the lake ‘the jewel of the Lake Region’ in and of itself. Here are two places you will enjoy visiting as time allows. 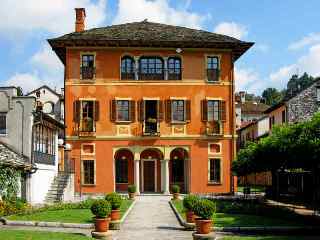 The village of Orto San Giulio uses Villa Bossi as the municipalities town hall. The gardens, known for their extraordinary compact beauty, run from the stunning rear facade of the villa to the lake. The gardens are open every day and, on frequent occasions, are closed for private weddings and receptions. 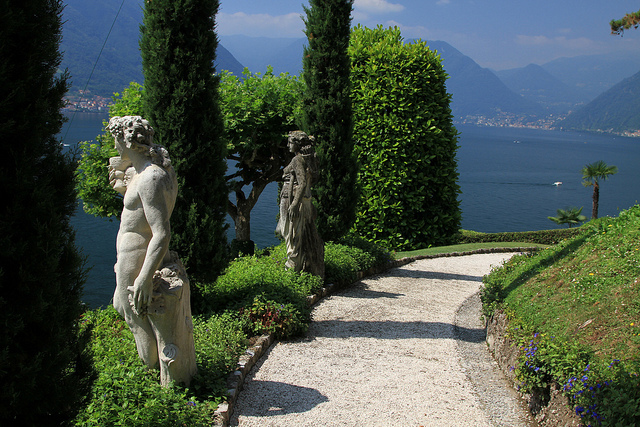 The views over to the island of San Giulio from these gardens is unforgettable. 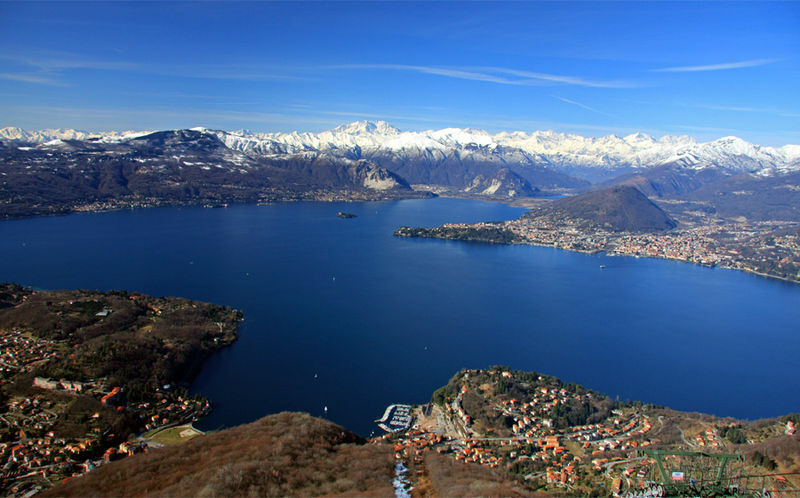 I have included the island of San Giulio, located about 100 meters from the shores of the village of San Giulio, as it is a lovely island. Cobblestone walkways ring the ancient convent and church, yet the views between villas, the glimpses of the lake and alps create the sense that visitors are surrounded by the gardens of Italy’s Lake Region. 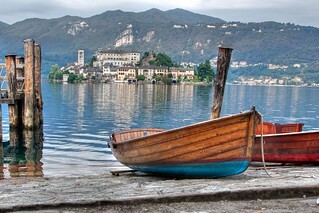 An earlier post on our blog, Lake Orta-Jewel of Italy’s Lake Region, has more details for those who are interested. No ticket required for garden visit. You can also talk directly to the many boat owners who play their trade on the lake. They can make arrangements to take you to and from the island.